i hope everyone enjoyed the holidays as much as i did. i could say that this is a new light, but that would be lying. it is however, newly out of the box that it has been sitting in for over 2 years! we finally hung this a couple of weekends ago. i say we, but i actually mean dave. the cord didn't exactly come out of the wall where we thought it would, but who cares. i certainly don't. special thanks to my dad for the awesome capital bread sign. dave doesn't like it, but i overruled his opinion. and also thanks to my dad-in-law for helping dave install the wiring. thanks!! i was lucky enough to be featured on the scoutiegirl blog last week. 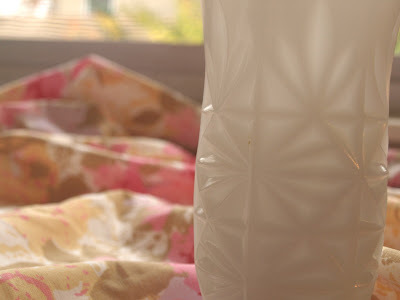 it was so cool to see my milk glass wares on another blog. and even cooler was scoring a sale of two beautiful milk glass vases to a buyer in france. it's so amazing to think that someone in france is enjoying these beauties. i really wish i could go to france at this very moment. i'll have to settle for a visit to this wonderful blog thecherryblossomgirl.com. this weekend i finally decorated the house for christmas! is it just me, or is december flying by at a record pace? i have done zero christmas shopping! actually, that is a lie, i have one gift half way done for a couple. we decided that this year we wouldn't get the usual big (relative to our little house), fresh cut christmas tree. there were lots of reasons, 1) i just got a great gateleg table from craigslist and it's for the only spot in the house that the tree would go, 2) our house is small and the tree looks exactly the same every year (the skinniest one we can find), 3) i always feel sad about throwing out the tree at the end of the season and 4) dave is bringing his pet lizard home during christmas break and the only place he will really fit is on top of the new table. we were going to skip a tree all together, but then we were at trader joe's and i spotted this tiny little beauty. it is perfect and we can plant it after the season ends. the table was also used for drinks at our holiday party. one of the best things about forgoing the tree was that i still got to use all of my ornaments in creative new ways. the star i used on the little tree is actually an ornament. the tree topper from previous years was placed on a shelf in the built-in bookcase. glass ornaments were placed in glass bowls and vases. some of the glass ball ornaments were strung on ribbon and hung from the bookcase as well. my favorite ornament is a little frame that says 2004, the year we were married. and another favorite, a wire tree from smith and hawkin. my mom bought it for me a few years ago. i hope everyone enjoys the holidays! moz sure is. he is doing really well with the recovery from his surgery. in a large mixing bowl beat butter and peanut butter with an electric mixer until combined. add sugar and brown sugar, baking power and baking soda . beat until combined, scraping sides of bowl. beat in the eggs and vanilla. stir in flour. stir in oats and chocolate chips. drop by rounded teaspoons on an ungreased cookie sheet. bake at 375 about 10 minutes or until edges are slightly browned. let cool for a couple minutes, then transfer cookies to wire rack and let cool completely. store in an airtight container. what cookies are you making this holiday season? do you have any paper bags laying around that are headed for the trash? well put them to use when wrapping gifts for the holidays. cut off the bottom and down a side to make a sheet of paper. wrap up the present. add some ribbon. this was leftover from a present i received previously. you can use some scrap fabric to make a cute card to go with it. either hand embroider or stitch on words for the occasion. pin to paper then use sewing machine or hand stitch onto paper or card stock. this is a set of paper that made from left over maps. the end product looked a little wonky, so i added a button from my stash that belonged to my grandma. i got to give my friend jeff his quilt over the weekend. i am pretty sure he loved it as much as i do. p.s. this was before i washed it so it was still a little stiff.